On a blustery Saturday in January, more than 2,000 people gathered at the College for Performance at Pomona, part of the region-wide Pacific Standard Time initiative celebrating the art of postwar Los Angeles. The crowd moved from Rains Center to Merritt Football Field and back to Marston Quad to witness recreations of seminal performance artworks from 1970 and 1971 by artists John M. White, Judy Chicago and James Turrell ’65. Each of these artists is represented in the three segments of the ongoing Pomona College Museum of Art It Happened at Pomona exhibition. The evening began with White’s Preparation F in Memorial Gymnasium. The audience gathered around the center floor as Pomona-Pitzer football players, in street clothes, streamed in to the gym and grabbed chairs from an artfully arranged pile. The players disrobed and changed into their gear, as they would normally do in the locker room; scrimmaged for a few moments; and then began to follow the choreographed movements of a coach (dancer Steve Nagler). White commanded the performance with a coach’s whistle. After the movements, they put their street clothes back on. Mark Swed of the Los Angeles Times noted in his review: “The physicality of the thudding of bodies in close proximity was compelling. The gym was crowded, but a sense of intimacy remained.” After Preparation F, the audience streamed outside into the brisk (but thankfully not rainy) air for Judy Chicago’s A Butterfly for Pomona on Merritt Field. This new pyrotechnic performance was inspired by her 1970 Atmosphere environmental performance at Pomona College, for which she used flares and commercial fireworks to soften and feminize the environment. In this 2012 performance, flares were used to slowly light up a large butterfly on the field. Viewers watched as the butterfly shone and, periodically, more fireworks and smoke-emitting pyrotechnics would be set off to heighten the visual effect. Closing the program, James Turrell recreated his 1971 performance Burning Bridges, a visual spectacle which used road flares to give Big Bridges the appearance of being lit on fire. (The original unannounced performance led a startled witness to call the fire department.) 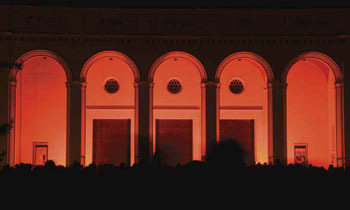 This time, with everyone (including the fire department) in on the joke, there was a crowd watching from Marston Quad as the flares, hidden behind Big Bridges’ columns, enveloped the building’s arcade in a brilliant orange glow and silence gave way to the rising sirens of approaching fire engines.